Increase sales and find new customers when you offer coffee "to go" in this LBP 7174 Beverage on the Move 96 oz. Pop, Fill & Go coffee take out container! This kraft container keeps hot drinks hot and cold drinks cold for up to 2 hours. The attractive border print offers a professional presentation, making it great for serving hot coffee in the morning, or for chilled coffee to pour over ice in the afternoon. It's great for holding hot water for tea, and for hot chocolate, too! With this container, you can rest assured that your bulk beverages will safely make it from operation to end destination. great looking product. this was exactly what I was looking for. great for customers who don't want to return catering supplies. I would definitely buy again. You will be glad you purchased this. This coffee traveler is great! We've been selling it at our shop for a few weeks now and our customers love it. We are so pleased with the quality and will continue to buy. These are great additions to our store as we have a lot of customers ask for portable containers, the only down is that they can be challenging to fill. Love this box! We brew directly into the box and have never had a leak! We can customize these boxes with our logo stickers. Keeps heat well and pours easily. We have been very pleased with these hot beverage boxes, more so than other boxes we have tried. The size and shape is easy to carry, pour and they keep the coffee hot for hours. Great product and easy to use. We like that we can use these for our local sales reps and business meetings. Very reasonably priced. Order yours today!! Love this container and love that I can buy in small quantities. I use these for when I have a catering job that needs coffee, it holds approximately 1 & 1/2 pots of coffee. We use these often. I think they perform better than the larger ones because the automatically pull the interior bag out so you don’t have to do it. We get these regularly and one and a while they don’t pop out the bag fully so there is difficulty pouring. Two of these were defective so I couldn’t fill it with coffee. And the one that did Work did not keep the coffee hot for very long. I won’t buy these again. Definitely not worth the money. Thank you for your review, Ricca! We are sorry this LBP 7174 96 oz. Coffee Take Out Container - 5/Pack has not worked well for you. A Customer Solutions Representative will contact you soon! We love these. They add a fantastic, professional service for our small town coffee shop. Events, meetings, and parties all use these as a convenient favorite. We got these to use for our coffee and hot chocolate, to offer for catering! These are extremely easy to "assemble", and hold about a gallon of liquid! Perfect for office meetings or picnics. Great coffee take out containers! They are relatively easy to fill and assemble. They are very easy to carry and keep the coffee hot! We use these frequently for coffee catering. These containers work well for carryout coffee orders for a small group. The keep coffee hot enough for around 3 hours and are easy to fill. We were a little hesitant buying these boxes because of the price, but they are great. We brew coffee directly into the bladder, and it works fantastic and holds the heat very well. A great coffee take out container and makes a great way to take coffee on the go for our meetings. A great quality and terrific price. Very sturdy and depended to go coffee box. Made of high quality cardboard and dense plastic bladder. By far best deal available on the internet. Joes to go are popular for businesses at our coffee and tea and these take out containers are the ideal product for our coffee to go! These have worked really well for us. They keep the coffee warm and hot. They are a bit expensive but they are by far the cheapest through webstaraunt. These boxes are the perfect option for our guests who want to take enough coffee for a meeting or group event. We have the caddy that attaches & we can fill with cups, lids & condiments. Super easy to build and great way to sell iced coffee and drip. Customers love them. I like it that it can be both for hot and cold. Great product. Great addition to our kitchen tools and to go menu. Great self serving option and our customers love it. Fall or summer this works for us. Very happy with purchase. Weill buy again. I love these caddies to use for tailgating. Nothing beats a hot cup of coffee on a chilly fall morning! But, you can also use these to keep apple cider and hot chocolate warm…just give it a good shake for any settlement that might naturally occur. these hold a full airpot worth of coffee (about 3L) and seem to keep the coffee warm enough for a few hours. they go together easily. These are great for our business customers just wanting a smaller amount of coffee instead of a large dispenser. It's also nice because they are disposable. These take out boxes are easy to assemble and pour coffee into. Our customers prefer to purchase these for large amounts of brewed coffee since they can just throw them away when they're finished, no need to return it to us. Kept our coffee warm and the simplicity of the outside of the container allows us ample space to label what kind of coffee we are serving. Great coffee to go containers, especially for the price. Keeps coffee hot for a few hours and liquid flows easily out of the spout. Will definitely purchase again. Our first experience with large coffee take out containers, we brewed right into the box without a problem and they are very sturdy, will re-order. Great for catering! Maintains coffee warm and Juice nice and cool. Would hold 6 cups (8 oz cups) of liquid for your office meetings or gatherings. These beverage take out containers are great for our customers looking for bulk coffee on the go! Great design, sturdy materials, and a breeze to assemble for anyone. They hold about 10 small cups of coffee, and the container isn't terribly heavy even when filled to the top. Keeps fresh brewed coffee hot for hours! we ordered these to have on hand for takeout coffee for customers. We were very pleased with the design but have not tested them out in the field yet. I do recommend them as I do feel they will be beneficial to us being able to take coffee into the community. These containers are well built and easy to put together but a big pricey. No matter where you shop for them you wont get them cheaper than this but compared to other coffee containers of all sorts these come off as expensive. That and the fact that it doesn't seem to really ever expand the foil bag inside large enough to truly hold 96oz of coffee gets it 1 star off. customers started requesting coffee to go and these are the perfect thing to use when we dont want to have them return the crafe and risk the chance of something getting broken. These boxes are simple to build and the best price on the internet. I've never had an issue with the inside bag leaking. My coffee customers know that they are getting the coffee they love in a box that won't leave a mess. This is awesome for our take out coffee business. Great Product and Terrific Price. Easy to use and we can't beat the great deal anywhere. This item meets my business needs. It is of good quality and looks great for customer use. The price is much better than other places. Easy to use reasonably priced to go container to use for small group sales. A must for any coffee shop or deli to increase sales. These are wonderful containers that hold an impressive amount of coffee and keep the brew hot for a good 3 to 4 hours. Not a bad price either. Great for my cafe to go coffee travelers. Easy to assemble and personalize with our stamped logo. A little pricey but conveniently available to purchase at short notice. Love these coffee boxes. They are a little challenging to figure out in the beginning, but only because we never filled them before. Great instructions and sturdy box. As a coffee Shop, we use these coffee take out containers on a regular basis. Our customers love that they are so easy to transport. These containers are perfectly acceptable, however, our staff hates them. The cardboard is flimsy, so if you spill coffee on it, it's practically ruined. Definitely get a good funnel for filling. These on the go coffee boxes were a great option for my big party and they were a HUGE hit! Everyone loved and wanted them. And they kept the coffee nice and hot!!! We just got these today and used one already. Customer loved being able to carry out 96 oz of our hot coffee. We used it in conjunction with stock #9997139 for a convenient package that held cups, stirrers and packets, etc. Really wish these were cheaper but it does beat having to get back you container after someone uses it. Customers can order a large amount and take it to go. Our customers love these take out containers! Perfect for hot coffee, hot chocolate, and other hot beverages in bulk. These keep their heat for hours too which is always a good thing! These work very well, just a little pricey. It's hard to turn a profit when most of the expense goes towards the packaging rather than the actual product. Good quality.. wish they were cheaper though. Nothing extravagant to be priced so high. The boxes are great clear cardboard so that they can be customized. It does what it claims! Only suggestion to buyers- go ahead and line the inner box with either bubble wrap or newspaper. This will allow coffee to stay hot for possibly another hour. Great product for cold drinks as well! I have had many customers ask me if I offered pots of coffee to go, with this nifty invention I have been able to say YES! This item is great for business meetings, but I also use it for marketing. We go to a local doctor's office or business and drop off one of these "Joe to Go" along with some pastries and leave our business card. They love it! These containers are great for meetings and other gatherings. Instead of people trying to carry several cups, it's much easier to carry this. It keeps coffee hot for hours. We used our rubber stamp on the outside to customize the item. Great addition to our menu. Hot breakfast with coffee and tea is an easier option to have on the menu with these containers. The insulation keeps coffee and hot water hot for hours and provides an easy and accessible container for customers to use. Great product. These are nice coffee containers that we use for catering. I feel as though these are expensive overall for what you get but the price on this site was hard to beat. we love using these mainly for catering events. that way there is no need to worry about getting an urn back. always hear great feedback from customers. These coffee take out containers are sturdy and well made. They have never leaked, nor have we ever had any problems. I will continue using this product. These are great! The only problem I've had with them is that when you pull the box open to construct it, the bag detaches from one of the sides. This has never effected the performance of the product but it always gives me a bit of concern. My customers love them because there's nothing they have to return. Each one of these arrives flat and you are to assemble it upright. They are supposed to 'self-inflate' but the bag tore off of the inside of the cardboard part on each one, after we unfolded them. I'm sure they will still work, but that is a tiny flaw. They look great, though! Very professional. Great looking and great functioning container. They are easy to put together and hold up very well. We have repeat buyers for this product and they have never complained about cold coffee. We put our cafe sticker on the front and they look very nice. This was my second purchase of this item. I love them. They keep hot drinks hot and cold drinks cold. We use them to give drinks for our homeless feeding ministry. Customers love these containers. Comes folded and easy to put together. I do use a funnel to fill the containers that way no coffee spills on the container. a must for any coffee shop or bakery serving hot beverages, they come flat and they are easy to make gives you 10 small coffees .. These boxes are great for holding liquids. I use mine for iced tea. Some cautions: when using a funnel for your liquids, fill it up halfway, cap it, and then let gravity fill out the bag before filling up the rest of the container. The bag inside doesn't fill out too well when it's standing up. Great container. We sell only tea and it works great for all of our over 60 flavors of tea. I like the plain box design. Most "coffee" boxes have coffee beans on the box and since we don't sell coffee, I prefer the plain look. I put our business label on the box and its good to go. We have been loving the 96 oz Coffee Take Out Containers. Our customer say they are easy to carry and keep their coffee hot for hours. A very popular item for our cafe. I love the size and profile of this large coffee takeout container!! It is easy to fill and carry to the office to share with everyone!!! with three kids and three different sports we need to visit, this take out container makes it possible. My wife and I drink a lot of coffee, so this makes it easy for us. these coffee take out containers are great for bringing your coffee on the go. i use them all the time to bring to my brothers baseball games for the whole family! When I first purchased these I planned on only using them for catering order but I have been pleasantly surprised to find out that these sell on a daily basis. A lot of our customers bring it to meeting or for their coworkers. Very good (and profitable) product! You fill these by taking off the cap in the picture and dispensing the coffee in through the out spout. I was kind of surprised there wasn't some kind of pour-control mechanism included. To dispense you simply remove the cap and tip the box forward. This seemed dangerous to me at first, but the box is well shaped and weighted and we've never had any problems. Just don't over-fill. We needed a convenient, compact, lightweight unbreakable way to transport coffee to an event. A small coffee pot or a larger industiral one were just not options. This 96oz. coffee container is perfect. Light, transportable, and no drips! I will be buying more and would definitely recommend this product. We include boxes of coffee with many of our catering orders. They are so simple to set up and fill with coffee or tea etc.. We stamp our logo right onto the box which makes for a nice and also easy presentation set-up. I also love how long the contents of the box will stay hot. We sell so many boxes of coffee and customers rave about the nice presentation and that the coffee actually stays hot for their meetings and parties. They work great when you need to just do a one way drop off - however, its always best to have real plug in coffee pots. Again we only use for one way drops. 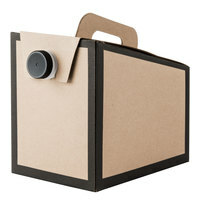 Great for catering to offices. Easy to transport, keeps the coffee very hot for at least 2 hours. This was a welcome addition to our menu. This item will help me in many ways. It provides customers who are entertaining a large group to provide coffee without having to brew. It also helps me in marketing.